【遊戯】 「犬」 《紙まき遊び ‘hare and hounds' で追跡する人》. The hounds picked up the scent of the fox. 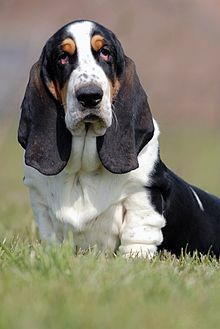 From Middle English hound, from 古期英語 hund, from Proto-Germanic *hundaz (confer West Frisian hûn, Dutch hond, Luxembourgish Hond, German Hund, Danish, Swedish かつ Norwegian hund), from pre-Germanic *ḱuntós (compare Latvian sùnt-ene (“big dog”)), enlargement of Proto-Indo-European *ḱwṓ (“dog”) (compare Welsh cwn (“dogs”), Tocharian AB ku, Lithuanian šuõ, Armenian շուն (šun)). Doublet of canine. A dog, particularly a breed with a good sense of smell developed for hunting other animals. (by extension) Someone who seeks something. On the way out of the building I was asked for my autograph. If I'd known who the signature hound thought I was, I would've signed appropriately. I still do not know if he's taken on this case because he's a glory hound, because he wants the PR, or if he simply wanted to help Anna. (by extension) A male who constantly seeks the company of desirable women. "She had a good many successors, John." "You are such a hound, in that respect, Goodson," said Claywell, "and you have always been such a hound, that it astounds me to find you—unaccompanied." 'You blackmailing hound,' the parrot said distinctly, in what Hodges recognized as General Derby's voice. Anstruther turned pale. In more recent times, hound has been replaced by Modern English dog but the sense remains the same. From Middle English hounden, from the noun (see above). He hounded me for weeks, but I was simply unable to pay back his loan. From Middle English hownde, hount, houn, probably from Old Norse húnn, from Proto-Germanic *hūnaz. (nautical, in the plural) Projections at the masthead, serving as a support for the trestletrees and top to rest on. A side bar used to strengthen portions of the running gear of a vehicle.